Minutes of Zoning SC November 13th; City Council Meeting November 13th, for acceptance. Proclamation to Circle Health in honor of Home Health and Hospice Month. National Grid Citywide Update – Manager Donoghue reports on meeting with National Grid last week. National Grid is going door to door to households with electric meters inside the house. National Grid agreed to notify the police when they will be doing this. What complicates this is that people from other companies have been following the National Grid reps around soliciting changes in individual household electric service. The second meeting was about the moratorium on gas work. There’s nothing further on this. FERC – City Solicitor says city sent letter regarding installation of another gauge for the river. The 50 foot level is part of a settlement between Enel and FERC. The city now is hoping for a 48 foot level for lowering the dam. Because of the new dam at Pawtucket Falls, it is easier and more feasible for Enel to lower the dam. She believes they are doing that now when water levels are predicted to be high, however, Enel will not renegotiate the level for lowering the dam. Fire Chief Windward says that last weekend Enel voluntarily lowered the dam when water level was forecast to be higher. He says Enel has been lowering the dam voluntarily at levels below they are required to by the agreement. Civil Service, LPD and LFD Hiring – Councilor Nuon thanks Police Chief for the report. Communication – City Manager request Out of State Travel (1) DPD. Loan Order-Wastewater Treatment Bond 450,000 – referred to Finance Subcommittee and to a Public Hearing, both on December 4, 2018. Public Safety SC November 20, 2018 – Council Nuon, Subcommittee Chair reports on meeting held earlier tonight. Topic was Restorative Justice. The theory is to have the offender make amends to the victim. That was done in the court. Eventually that migrated to the Butler School where it has been implemented. The subcommittee urges the Mayor to ask the School Committee to expand the restorative justice in the public schools. Councilor Conway – Req. City Mgr. provide a report regarding signage and accessibility at polling locations throughout the City for people with disabilities. Councilor Nuon – Req. Mayor introduce a motion before the School Committee requesting the LHS social studies department write a more fitting testimonial to display with the portrait of Benjamin Butler in Lowell City Hall. Joe Boyle speaks in favor of the motion. Council Nuon says he has learned much about Butler recently and that if he did not know this information, many others in the city, especially young people would not know it either. Councilor Kennedy amends the motion that whatever is produced come back before the City Council for approval. Motion approved. Councilor Nuon – Req. City Mgr. have DPW provide an update regarding upgrading of City street lights to LED. Councilor Nuon explains that brighter lights will make our streets safer for everyone. ANNOUNCEMENTS – Mayor’s holiday concert is next Tuesday at the Zorba Room, $20 admission, to benefit homeless youth. 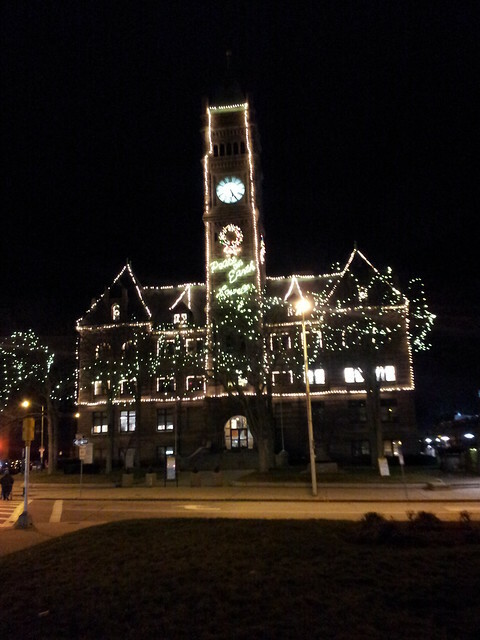 Tuesday, December 11 is City Hall holiday open house. City of Lights parade this Saturday at 4:30 pm. Councilor Elliott asks to suspend the rules to bring up an issue related to a bicycle race at Shedd Park this past Sunday. Says it’s an 8-hour event organized by an outside organization, but the running track has essentially been ruined. It will cost the city much to make repairs. Manager Donoghue says they have received numerous reports. They had gotten a permit from the Board of Parks but the weather made it inappropriate to use the facility for that purpose at this time. Councilor Kennedy and Manager Donoghue both believe that the same group last year actually paid for full repairs but that will be in the report.